Alshon Jeffery's worst ever mistake came at the worst possible time. 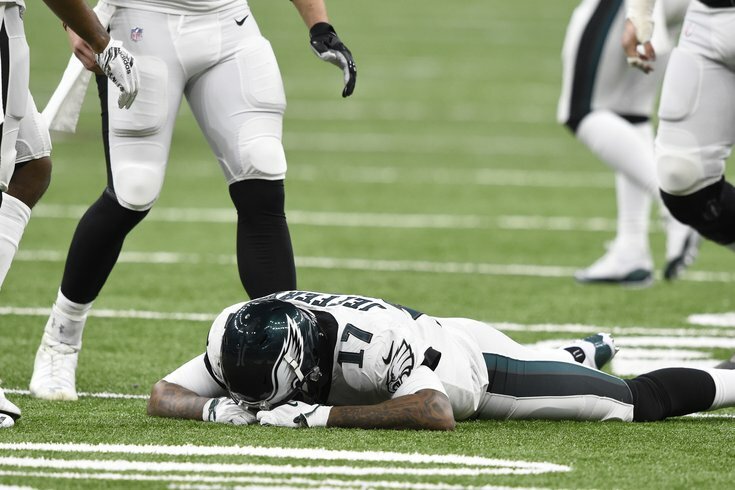 The Philadelphia Eagles' title defense came to an end Sunday night in New Orleans when wide receiver Alshon Jeffery — usually a sure-handed pass-catcher — dropped a key fourth quarter toss from Nick Foles. The ball ricocheted into the hands of Saints' cornerback Marshon Lattimore. and Jeffery buried his helmet into the turf. Seeing Jeffery's pained expression, hearing his post-game comments and reading all the supportive messages from Eagles fans reinforced how important Jeffery has been to Philadelphia's success over the past two seasons. You win as a team and lose as team, no matter how crucial any given play might be. On Tuesday morning, Jeffery may have received the sweetest pick-me-up he's gotten yet. Abigail Johnson, a second-grader from West Chester, wrote Jeffery a letter reminding him of his value to the Eagles. The letter was posted on Twitter and tagged to Jeffery by Abigail's father, Raymond Johnson, a West Chester pastor. I am a huge Eagles fan. When I watched the play last night I was crying. It's okay to loose a game you don't always have to win a game. We couldn't have won the superbowl without you last year. I think you are a awsome player no matter what. It takes lots of practice and curage to catch a ball. I think you are a good athlete. It takes a lot of practice to become a good athlete. I love you! My whole family was rooting for you! Don't give up on playing football. Keep practicing. Don't get mad esaly. I know you can do it. We all know you are a good player. You hear that, Alshon? For Abigail's sake, put this one behind you. She loves you.